Keep checking this page for updates to my Portfolio. This is where I showcase some of my memorable creative works. I worked on some of these produced videos with my family or friends. My eternal gratitude to Maya Walker for “showing me the way, by example” in Facebook. While I was busy co-organizing the E-2010: 9th NaFFAA Empowerment Conference, my siblings and I made a special trip to Hercules, CA where our sister, Myrna de Vera, was running for one of two Councilmember slots. We took the time to have a family reunion and went to the Sears Studio in Concord, CA for our once-every-decade (or less) photos. This time, we had our baby brother with us (our only surviving brother). Featuring: Lorna Dietz, Noemi Dado, Myrna de Vera, Belen Dofitas, and David Lardizabal. 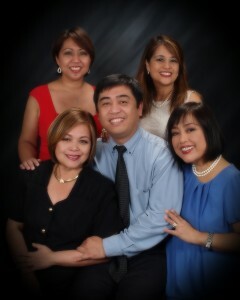 A Video Documentary of a Political Campaign: My sister, Myrna de Vera, will become the City’s Mayor in 2014 (thereabouts). I wish her well during her stint as Councilmember in 2011. When the Canadian model, Andrew Philip, asked me to be his Facebook friend, I thought that the photo on his profile page was a fake. Yet, I did some research and found out that he had been modelling since he was 17 years old. Thus, a beautiful online friendship was formed among us: Michael Davantes (his manager), Andrew, and I. It was my second attempt at creating a video portfolio that got both men’s approval. Here it is. Giannino Ricci, a professional model and actor since he was about eight years old, is one young friend whose “star” I’m looking at. Promoting conventions and conferences through video invitations is still a relatively young technological strategy. Here are a couple I created. Robin Mann & ALS South Bay Walk: This is one of the most challenging video invitations for a fundraiser I have ever done. I cried when I saw the resulting video. Mohinder Mann, one of my BFF’s and Robin’s husband, and I worked on this video, with input from Congresswoman Zoe Lofgren and Robin Mann herself. I also attended the ALS South Bay Walk — and they raised a ton of money for ALS research. Robin rocks! A social media video announcement I created for GMA Pinoy TV about a special TV interview during President Benigno Aquino III’s visit to San Francisco, CA on September 25-26, 2010. How to promote an auction and opportunity drawing by using a video slideshow. This is the one I created for PhilDev USA (formerly known as Ayala Foundation USA) for their event on September 25, 2010. GMA Pinoy TV and GMA Life TV were the exclusive TV media sponsors. A Books for the Barrios fundraiser. Our “Happy Birthday!” greeting to Greg Macabenta. Check out the posting I wrote at FilipinaImages.com about Babae Ka.